Hortense B. Hewitt 55498 Beverage Napkins, Cocktail, Greenery by Hortense B. Hewitt at WP Ultimate Social. MPN: 55498. Hurry! Limited time offer. Offer valid only while supplies last. Add a special touch to any occasion with soft, three-ply Greenery beverage napkins with touches of gold foil. These napkins come in packages of 50. Add a special touch to any occasion with soft, three-ply Greenery beverage napkins with touches of gold foil. These napkins come in packages of 50. 4-Color digital Print and gold foil stamp design. ORDER extra napkins for your bar, snack table, and happy hour. These napkins aren't just for weddings though - add them to your bar at home for entertaining as well. 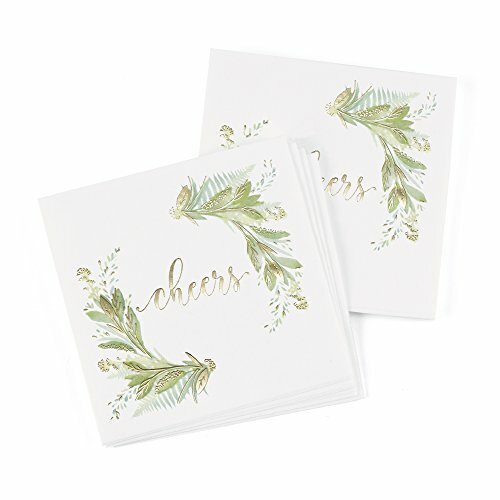 Greenery shades of Green with gold foil accents spread your love throughout a special day, look for the entire collection, exclusively from Hortense B. Hewitt.